Those living and working on Bend’s northside have a new place to enjoy happy hour while waiting out the rush hour line of traffic that builds up on Empire Ave. The Backyard Brick Oven Pizza & Sports Bar opened earlier this year and provides diners a casual spot for happy hour cocktails and appetizers. Whether your thirst can only be quenched by a cold beer or you prefer a signature cocktail, enjoy $1 off all drinks and $2, 16 ounce beers during happy hour. The Backyard’s drink list includes a Jamo Shot N’ Beer menu that pairs different varieties of Jameson whiskey with local beers. Try the Jameson Black Barrel, a whiskey aged in double-charred bourbon barrels, and a Boneyard RPM IPA. Signature cocktails vary to please every palate, many mixed with locally crafted spirits. The Backyard Old Fashioned uses C.W. Irwin whiskey and house-infused cardamom honey. All of the appetizers at The Backyard are fresh, not frozen. 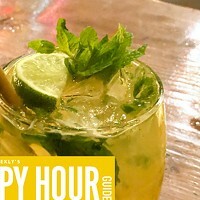 While the bulk of the happy hour app menu includes fried foods: zucchini, mushrooms, pickles, mozzarella sticks and fries or tots, you can also get veggies and hummus for something lighter. 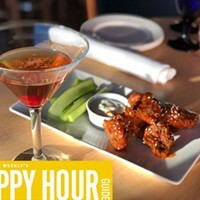 Quickly becoming known for their wings, at happy hour you can get six huge wings for only $4 or 12 for $7. Wings come in a variety of sauces; a perk for those of us who can’t handle the heat of hot sauce. Pro tip: Can’t make it in time for the traditional after work happy hour? 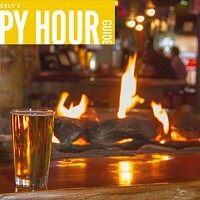 Head to The Backyard for their late night happy hour from 9 to close. 63130 NE Lancaster St., Bend.